Below: I am not sure i Have ever seen a more repaired sheath than this one. It is off an original Second Pattern Wilkinson in nearly equally poor condition. The blade of the knife is so worn and tarnished that the Wilkinson logos are almost erased. This sheath has also been modified to fit an American web pistol belt. In addition the frog has a slot of a suspender button(or similar) attachment. The chape has been crushed but is still functional. Below: Two Shanghai Dagger sheaths. They were designed to be carried under the arm pit with the knife blade up and handle down. The top one may be a later replacement and is stamped Gieves and Hawkes Ltd.
Below: A Sheath which contained a nicely made x-dagger stamped on the blade "WSC" and an additional "C". The knife was the personal property of Major Paul Dehn from Camp X and is one of those designed for hanging from a suspender button. A very close look reveals the faint imprint of one. 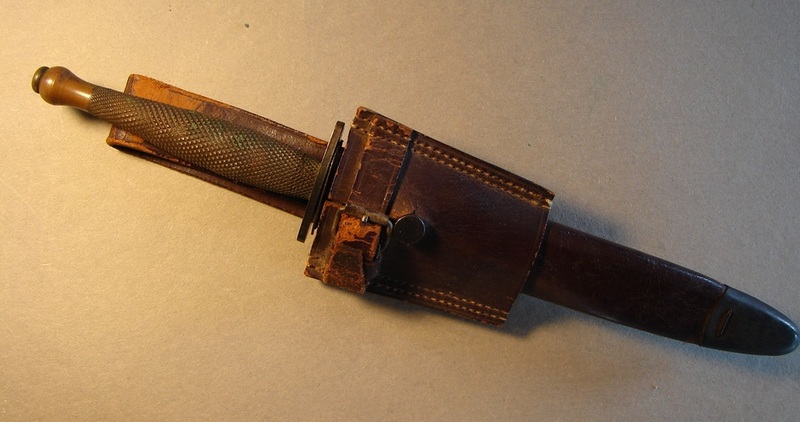 Below: This rugged sheath is made from a cut-down bayonet sheath and housed an X-dagger made from a Wilkinson 1888 Metford bayonet. The frog is stamped with the makers name in an arc just above the throat (illegible) and the Canadian mark, a "C" enclosing a broad arrow. Below: I think this was a factory produced sheath which has seen many repairs. I am inclined to believe that the missing rivets (and unusual circles) may have been made by foreign coins which had holes suitable for riveting to the sheath and they were removed at some point for their individual value. 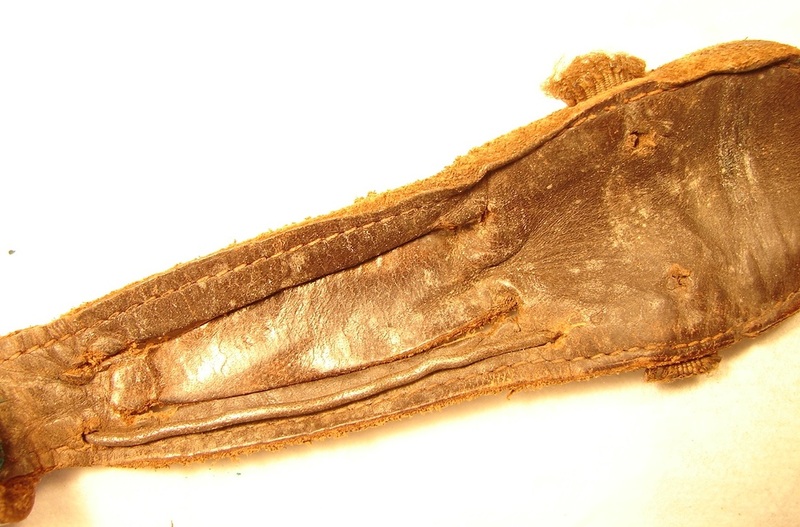 Below: Quite often the stitching holding the leather belt frog to the body of the sheath would disintegrate. This is one sound method of retaining the sheath by using a webbing frog. from a bayonet sheath. This owner even went so far as to install what appears to be a wrist watch band for a retaining strap. Below: This badly worn sheath is made from canvas web material on the front and thin leather backed. I cannot figure out how the leather straps were used. There is no method of weapon retention. Perhaps the knife was held in by a thong or cord of some sort. The sheath straps were probably buckled to other permanently mounted straps on some piece of battle gear. The sheath shown below is a commercial variety reinforced by a former owner with some sheet copper and simple paper fasteners. The following sheath was made in India and is poorly tanned leaving the leather hard and brittle. The metal chape is also poorly formed and simply glued on. This sheath house a very nice beaded and ribbed knife. The next sheath came with the OSS Stiletto as shown. It is a modified-cut down British bayonet sheath. Illustrated below is a leather lined canvas web sheath for a Polish Commando Knife. 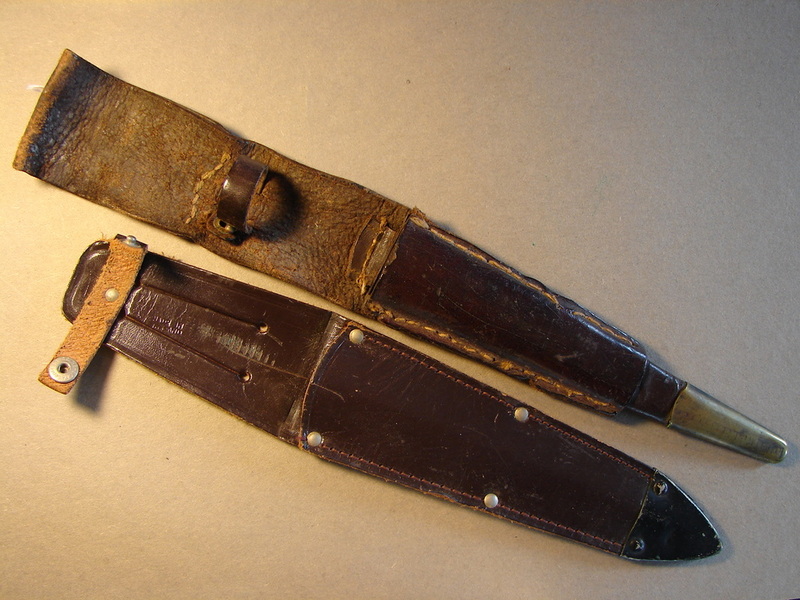 Two sheaths, one bottom one is a commercial style with reinforced chape at the tip, and the other one is field modified to reinforce/replace the frog. Below: Sheath for an unknown knife but had a nickle plated P-2 stamped N.G.K. in it when I bought it. The frog is actually twice as long as it appears. It has been folded back and laced in place. The actual frog is as long as those on V-42 sheaths. Below: A fine sheath handmade specifically for a Wilkinson Sword Co. Nickle plated P-2. I has a typically American "lift the dot" strap fastener. Below: American sheath from a Johnson Bayonet. It came with a heavy bladed early P-3. Below: Field repairs to the frog on this heavily carried knife include the addition of a piece of heavy wire to reinforce one belt slot. Below: The sheath illustrated below came with a wooden handled F-S in it. The leather is very heavy and stiff. The retaining strap is made from a watch band. This is a fix I have seen on several sheaths. There is no belt loop and the knife must have been thrust into the waistband behind the users belt. Below: This sheath was a commercial version and for some unknown reason (maybe in an attempt to waterproof it) was completely covered in a brown adhesive tape. The tape was also used to attach a braided metal battery ground strap whose eyelet could be used for a leg tie down. The knife in it was a wooden handled third pattern wrapped completely with a cord, then died brown.